INTERNAL ERROR: Can't open file 'MAPS/_Tex/TB_e0.tga' INTERNAL ERROR: LoadTextureFromTga('MAPS/_Tex/TB_e0.tga'). I went into the _tex file and found a TB file which contains TB_e1.tga' and TB_e2.tga' . Not the one mentioned. THANKS! Your last de-compression fix did the trick. Once again a very fine road mod! ...and "Viola", same here, now working just fine. For those who may find the following useful, here's my steps, after initial failures (see earlier posts) to successfully loading the map (you can leave the all.ini insitu IF it reads as... vkg_El_AlameinCR vkg_El_AlameinCR/load.ini ). 1. Completely un-install/delete the complete contents of the El_Alamein zip, ie the Tex & Map files. 2. Re-download Nowekats latest El_Alamein zip then extract contents to wherever you wish, desktop is good. 3. Install as per Nowekats instructions. Great Stuff Nowekat & thanks to those others too like Mechanic who helped with the problem solving. What a community we have here!! 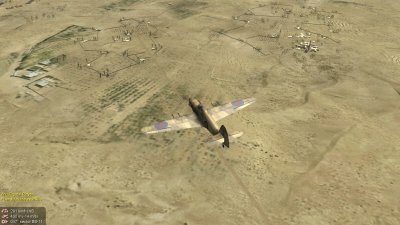 Hadn't thought of that, so I went to M4T and downloaded Poltava's Libya_1941_Hurricane campaign which uses the JV69_LYBIA_N-E map, edited the first mission .mis file to recognize the JV69_Lybia_NE_CR map and yielded a working mission with curving roads (see attached images). With Poltava's permission I would be happy to try and edit all 9 missions within the campaign and make them available directly here or through him. Once again many thanks for your innovative work ! 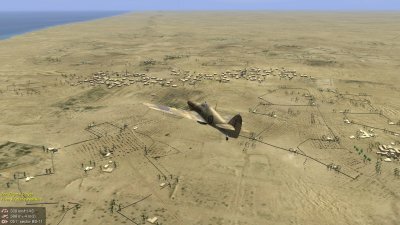 ElAlamein map loads/saves no issue - but new CR Libya wil LOAD, but can;t SAVE mission (either CR version of it??) Any suggestions Pls? jijrod, the TB_e0.tga is a cloud texture and i think it's a standard file. If your other TB-files are also clouds, just rename one. You named the problem but no help is possible when someone just is posting "there is a problem." A log is needed here. These maps look superb with the new roads, thank you very much, really appreciated. Thanks to Nowecat and everyone working to get these wonderful curve roads maps into IL2. It will be very helpful, once all problems solved, if someone can please post the whole corrected .7z files for these maps in this forum. Thanks in advance and congratulations for a great job. Thank you very much for these new maps ! A quick question: What is the initial version of this map? 412 ? 413 ? Because I see I'm missing static objects. Maybe you're the one who added objects? Enjoy the curved road scenery. Excellent work also on the NWeurope dearest Nowekat! Unfortunately I tried to correct the map JV69_Lybia_NE_CR, but I can not open it, a real pity, if you consider that 70% of my fun happens on the African skies. I do not think conflicts with that of JV69 ....or Yes ? ?